Media stories of shootings, drug trafficking, and family alliances within the Indo-Canadian community have become shockingly familiar. But what happens behind the headlines? How and why do youth become involved in gangs? How do issues of identity and tension between generations – problems shared by all segments of Canadian society – figure into the equation? 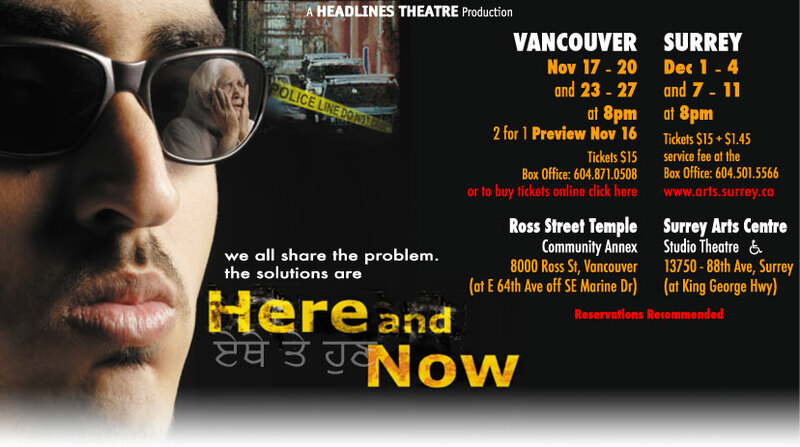 Headlines Theatre is working with members of the Indo-Canadian community to ask these and other difficult questions, and invite the public to offer creative answers at Forum Theatre events called: Here and Now. Headlines Theatre Approaching the organisation’s 25th anniversary in January, 2006, Headlines Theatre has produced hundreds of Theatre for Living workshops and performances around the world. Artistic Director David Diamond has adapted Brazilian director Augusto Boal’s Theatre of the Oppressed to a contemporary context. Diamond’s approach shares a starting point with Boal, using the powerful language of Image Theatre – metaphor, symbolism, archetypes, (cut play) – as a means for communities to investigate difficult issues. However, embracing concepts of systems theory, Diamond has left behind the binary model of Oppressor and Oppressed to create plays and stimulate community dialogue woven with the complexity and ironies of real life. Grassroots participation. The process began with an intensive six-day workshop with 22 community members who have a direct connection to the issue. Theatre techniques were used to uncover the deep-seated desires, fears and motivations at play, and better understand the intricate dynamics contributing to the problem. An authentic voice. The material gathered in the workshop is now being used as a springboard for development of a play, created and performed by a cast of seven workshop participants. Public dialogue. At performances, the audience will be invited to stop the action of the play, replace characters onstage, and test their ideas for resolving conflicts. The interactive events provide an engaging forum, yielding surprising insights. By adapting the methodologies of last year’s award-winning Legislative Theatre project, Practicing Democracy, the production will generate a Community Action Report that contains concrete suggestions for social service agencies and anti-violence programs that the community itself believes would be effective. The report will be compiled by Kashmir Besla, a Lower Mainland family counselor who works with families and women in violent relationships, and in child protection. Upon completion, the report will be made available to the public via Headlines’ web site. Balinder Johal Born, raised and educated in India, Balinder came to Canada in 1965 and taught in the BC school system and at the Vancouver community college for 24 years. She has worked in theatre, educational videos, TV and film in English, Punjabi and Hindi. Her Chachi ji episodes on community-related issues have been an attempt to bridge the cultural, educational, gender and generational gaps. worked as a Community Support Worker with the Downtown Eastside Residents Association (DERA) and is set to start working as a Support Facilitator with the Surrey Urban Youth Project. He is expecting to complete a BA in Sociology at Simon Fraser University by December and spends his spare time studying political-economy and engaged in anti-war and anti-racism campaigns. Natasha Ali Wilson Twenty-two year old Natasha is a professional performer. She has guest starred in many projects including Huff, an HBO Drama with Oliver Platt and Hank Azaria and played a lead role in Return to Cabin by the Lake a feature film with Judd Nelson. She has also been writing and recording vocals with local artists. Raminder Thind Born and raised in the District of Patiala, Punjab, India, Raminder is a triple post graduate in Theatre, Journalism, and Public Relations & Advertising from Punjabi University Patiala. In India, he is a well-known as a theatre professional who has strived throughout his life to highlight community problems through theatre. He has been involved in social justice work from a young age. Since coming to Canada a year ago he has seen that these issues exist in his local community and in his family. The issues being connected to his life and his desire for change lead him to Headlines Theatre, and Here and Now. Seth Ranaweera is intrigued by the exploration of violence in the community because of his own early experiences with violence. He hopes that this project is able to bring about a significant and positive dialogue between 1st generation immigrant parents and their 2nd generation children. We must, he says, find a way to break the cycles. Shawn Cheema is a 19 year-old who has experienced the drug trade firsthand. “I thought I could take the easy way to making money, but it turned out I was on the wrong path. I lost over $1,500 out of my pocket. I just want to send a message to all the people in my generation, that this is not the right way. I was promised over $1,000 a week, but was faced, instead, with death within 48 hours if I didn’t come up with the money. I also had trouble with my family because they are from India and I am from Canada. There was a really big communication problem. I didn’t know how to talk to them or be open with them. I just hope that I can share my experiences with everyone else and make a difference in my community.